Gov. 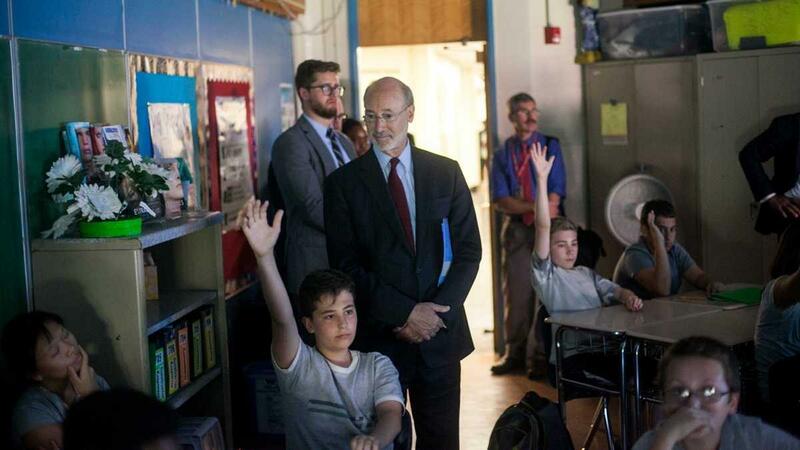 Tom Wolf observes students during a visit to Baldi Middle School in Northeast Philadelphia. The Pennsylvania Department of Education will unveil a new school quality metric in 2018 — dubbed the Future Ready PA Index — that it believes will foster a more holistic student experience, one less narrowly focused on state standardized tests. The change was announced Wednesday as part of PDE's plan to comply with the Every Student Succeeds Act (ESSA). That is the flagship federal education law, updated under President Obama in 2015. Under that law, states were given more leeway in how to set education policy and spend federal public school dollars. "It's provided Pennsylvania with a once in a decade opportunity to revisit our assessment, accountability, and student support systems, and make changes with greater autonomy than we've been able to do in the past," said department deputy secretary Matthew Stem. "It's really given us an opportunity to focus on more holistic supports and holistic instructional strategies." Pennsylvania will still have a strong, federally required commitment to standardized testing with scores broken down by subgroup, but Stem says the new plan will push schools to foster better critical thinking and collaboration skills. He says this will happen, in part, based on a change in how the state evaluates school quality and reports the results. "We believe that trying to use one number to say that one school is better than another is a flawed approach," said Stem. That is, essentially, the state's current system. The School Performance Profile, which was introduced in 2013 under former Governor Tom Corbett, a Republican, relies heavily on state tests to rank schools on a numbered scale. At last tally, that scale ranged from 24.7 (Pittsburgh's Academy Charter School) to 101.6 (Chester County's Unionville High School). With PDE under the control of Governor Tom Wolf, a Democrat, the Future Ready PA Index will add more non-test-related indicators to the evaluation system, and it's being designed to expressly discourage users from making overarching comparisons between schools. Users will see a dashboard of different data points for each public school in the state. Ratings in each subcategory will not be aggregated into an overall score. Stem says this will allow localities to make their own priorities for which data points to value most highly. Ultimately, he says this will better serve Pennsylvania's business leaders and job creators. "They want to know that their future employees have critical thinking skills, and are able to collaborate on teams and demonstrate persistence and grit, and those are all very difficult to measure on point-in-time assessments," said Stem. Gov. Wolf has echoed similar sentiments since early in his term. Critics of SPP say it unfairly marginalizes schools that largely serve students living in poverty, who also have higher than average rates of deep special education needs and/or English language learner status. Proponents of SPP say it holds all schools in the commonwealth to the same performance-based accountability expectations, providing transparency to parents and taxpayers. Recognize schools for reducing the percent of students scoring at the "below basic" level. PDE also aims to reduce the amount of time schools devote to testing each year by trimming the number of sections on the PSSA exams taken in grades 3-8 — cutting the English test from four to three sections, and the math test from three to two sections. The plan comes on the heels of dozens of meetings with a diverse selection of stakeholders across the state spanning many months. PDE's new ESSA plan also sets targets for standardized-test proficiency. The state aims to reduce the percentage of non-proficient students by 50 percent by the end of the 2029-2030 school year. In 2015, 62 percent of students in the state scored proficient or advanced in English, and 43 percent did so in math. This goal would mean proficiency rates would rise, respectively, to 81 and 72 percents. The 2002 version of the federal education law, known as No Child Left Behind, called for every student across the country to be proficient in math and English by 2014. That didn't happen. Stem believes the goals set forward by PDE's new plan are both ambitious and achievable. "We're going to be very public about our progress as a state towards moving students towards those goals. And hold ourselves accountable for creating the systems that foster that type of growth," he said. The new plan also aims to increase the four-year high school completion rate, The 2014-15 four-year graduation rate is 84.8 percent, which exceeds the national average. PDE wants the rate to exceed 92 percent by 2030, moving it from the midpoint among states to the top quarter. "It should be noted that all long-term goals are predicated on predictable levels of federal and state investments in education programming," says the report. Like No Child Left Behind, ESSA requires states to identify and intervene in its lowest-performing five percent of schools, with a wide variety of options for action. Moving forward, PDE says it will change the way it compiles its list of lowest performers, giving more weight to how schools are growing academically year to year. PDE's new plan also touts the state's commitment to school funding equity. But the report offers little in concrete policy or recommendation to change the baseline realities of Pennsylvania school funding — a system where local property tax revenues make up the lion's share of resources and only a small fraction of state money is distributed based on accurate student enrollment and need. PDE's plan, though, will push a new school finance reporting system that aims to make funding realities clearer and easier to understand for the public. Among a host of other changes aimed at improving the effectiveness of teachers and the outcome of students, the report spends significant ink in an attempt to offer a more nuanced perspective for teaching and evaluating English language learners and migratory students. The plan is open to public comment until Aug. 31. Correction: A previous version of this story said that public comment was open until September 2nd. Many colleges send incoming students a copy of the same book, or common reader, in the summer. The idea is to give students a shared experience before coming to campus. Some schools send books to just freshmen and incorporate the themes of the text into orientation. Others expect the entire campus to read the book. In Pittsburgh, only two universities have common read programs. The mention of summer school might conjure images of students stuck inside on beautiful days and kids upset at their parents for forcing them to attend. But there's a summer program that's the opposite of that — and it's outdoors. Families are already at the community pool, splashing and squealing in the water before 9 a.m.
Outside the fence, 6- and 7-year-olds stand in a circle, playing a rhyming game outside a picnic pavilion at the Boyertown Community Park in Berks County.